A clip showing the moment a female soldier disgraced two men in public has gone viral on social media. 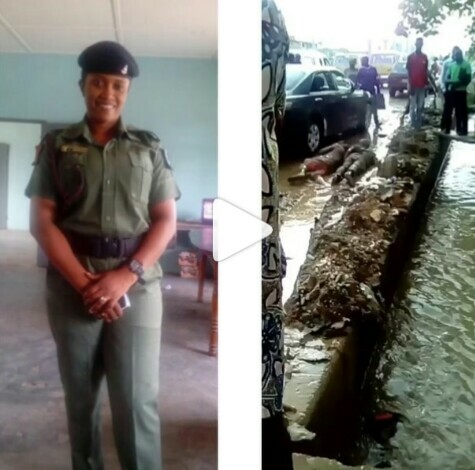 The soldier identified as Patricia Ajie, subjected the two men who happen to be a driver and his conductor, to an extreme inhuman treatment on Tuesday. Reports indicate that she punished the men simply because they used their bus to scratch her car’s side mirror under Dopemu bridge in Lagos. Ajie, after making them pay for damages, went ahead to instruct them to clean her boot before ordering them to lie down inside a muddy water and forced them to drink it. The female officer was also accused of harassing those who tried recording the incident.